^ a b Hardie, Giles; Hornery, Andrew (20 August 2011). "Leo sweeps into Sydney". Brisbane Times. Archived from the original on 7 March 2012. ^ a b "Baz Luhrmann casts VCA graduate Elizabeth Debicki in The Great Gatsby". University of Melbourne. 25 May 2011. Archived from the original on 7 March 2012. ^ a b Blake, Elissa (19 May 2013). "From Paris with love". The Age. Archived from the original on 2 September 2014. ^ Cantelo, Sigourney (6 November 2012). "Our fair ladies: how to maintain pale skin". Vogue Australia. Archived from the original on 14 October 2013. ^ Bakker, Tiffany (9 August 2015). "Aussie starlet Elizabeth Debicki almost missed out on her biggest role yet". Sunday Style. news.com.au. Archived from the original on 1 January 2016. 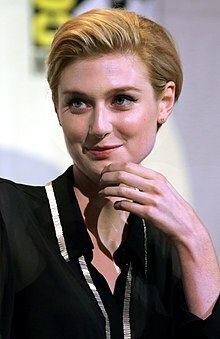 ^ a b "New Aussie in Hollywood, Elizabeth Debicki, steals the film in the upcoming spy drama, Man from U.N.C.L.E.". mindfood.com. 3 August 2015. ^ Lehmann, Megan (11 May 2013). "Her roaring twenties". The Weekend Australian Magazine. Archived from the original on 11 June 2013. ^ a b Lockyer, Daphne (7 February 2016). "'I want a co-star I can look in the eye': Meet Elizabeth Debicki, the 6ft 2in actress who's tipped for the top". Daily Mail. ^ Marriner, Cosima (22 April 2018). "Catching her breath: Why Elizabeth Debicki is moving to London". The Sydney Morning Herald. ^ a b Rule, Dan (2012). "True Hollywood Story". Melbourne University Magazine. Archived from the original on 9 April 2013. ^ Groves, Don (7 May 2012). "The tale of two Elizabeths". Special Broadcasting Service. ^ Bowen, Sholto (1 February 2008). "From the Principal". The Huntingtower Bulletin. Archived from the original on 18 May 2013. ^ "2009 Theatre Scholarships announcement including $20 000 Keith and Elisabeth Murdoch Travelling Fellowship". The Melbourne Newsroom. The University of Melbourne. 31 August 2009. Archived from the original on 17 July 2010. ^ Fleming, Mike (11 May 2011). "Newcomer Elizabeth Debicki To Play Jordan Baker In The Great Gatsby". Deadline Hollywood. Retrieved 13 June 2011. ^ Bulbeck, Pip (6 September 2011). "Baz Luhrmann's $125 Million The Great Gatsby Begins Production in Sydney". The Hollywood Reporter. Retrieved 6 September 2011. ^ "Behind-the-scenes at Elizabeth Debicki's Vogue Australia photo shoot". Vogue Australia. 2 November 2012. Archived from the original on 6 October 2013. ^ "Elizabeth Debicki in Vogue Australia". December 2012. ^ Verghis, Sharon (1 June 2013). "Maids of dishonour, Cate Blanchett and Elizabeth Debicki, unite for STC's Genet". The Australian. ^ Saxby, John (21 January 2014). "Oscar on the horizon, but Blanchett misses out for her theatre work". The Sydney Morning Herald. ^ Knox, David (29 July 2013). "Cameras roll on Rake's third season". TV Tonight. ^ Kroll, Justin (31 July 2013). "Great Gatsby's Elizabeth Debicki Attracted to Man From U.N.C.L.E. (Exclusive)". Variety. ^ Hopewell, John (6 February 2014). "Michael Fassbender, Marion Cotillard Roll on Macbeth". Variety. ^ "Offspring star Matt Le Nevez returns to TV with Elizabeth Debicki in The Kettering Incident". news.com.au. 26 July 2014. ^ Petski, Denise (5 March 2015). "Olivia Colman, Tom Hollander, Elizabeth Debicki Join AMC's The Night Manager". Deadline Hollywood. ^ Anderton, Ethan (9 May 2017). "Guardians of the Galaxy Vol. 3 Is Bringing Back Elizabeth Debicki as Ayesha". slashfilm. ^ Horst, Carole (1 November 2017). "AFM First Look: Elizabeth Debicki, Gemma Arterton in 'Vita & Virginia'". Retrieved 17 November 2017. ^ "The Red Barn – National Theatre". www.nationaltheatre.org.uk. Retrieved 17 November 2017.